I was having a conversation with a friend tonight. He was fortunate enough to attend one of a few magnet schools with a very unique structure. The business students ran a business fixing cars. The auto shop class fixed the cars. The IT students networked the business. The business students also ran an event/catering business. The agriculture classes grew much of the food. Cooking classes prepared much of it. Again, the IT students did the networking. There were many other moving parts, as well as a relatively standardized college preparatory pathway. The difference is the emphasis on earning concrete qualifications and on the job experience in many of these other fields in which credentials and experience are helpful, and a four year college degree is not. The IT students left with certifications recognized nationally to work on networking equipment and write software. I thought of the work that I did while I was in school for Computer Science and the work I did after I graduated, its similarity, and the value I actually got out of my college degree other than the piece of paper with a seal on it. I had a good time at the University of Delaware. I learned a lot. Not all of it in the classroom, and not all of it terribly relevant to what I did for a living in the 3 years following my graduation. Very little of it relevant to what I've been doing for the last two years, but I wonder how much more I could have achieved in that time if more of my high school years were spent pursuing the credentials that were available at my friend's magnet school. I went to Caesar Rodney High School (Class of '03) and thought I had done pretty well for myself, but I failed to even imagine the possibilities and I do remember a number of conflicts between my best teachers' own recommendations and the regulatory requirements enforced by administrators. I graduated before No Child Left Behind really came into full force and well before Race to the Top had even been conceived. I can only imagine how much more complicated it has gotten for the average parent, student, and teacher, never mind students with special needs. 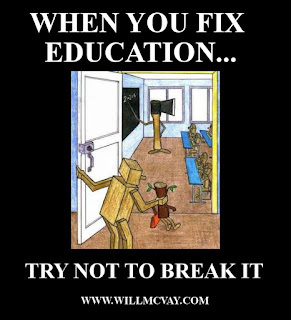 The lesson I took away from my conversation was that a GREAT deal more flexibility must be allowed into our educational system. At present, our public education system little resembles a place where creative thinking is inspired, research and learning skills are developed, and basic skills are effectively imparted to new generations. Instead we have tests. We have statistics. We have bureaucracy and administration. Don't mistake my meaning. Metrics are good, metrics are important, but they must be metrics that carry meaning to parents, students, and future employers. Students who move through these educational programs must come out prepared to participate in a competitive job market where new skills must be constantly acquired and developed to keep up with changing needs of a constantly changing economy. The key to achieving that is flexibility. Teachers must be freed to develop relationships with their students. Schools must offer a variety of pathways for students to follow that take advantage of their unique skills rather than forcing every student to follow the same process as if all of them were identical and headed inexorably for a predestined fate. That is not the world we live in anymore and it is contrary to the empowerment we all deserve as free individuals. 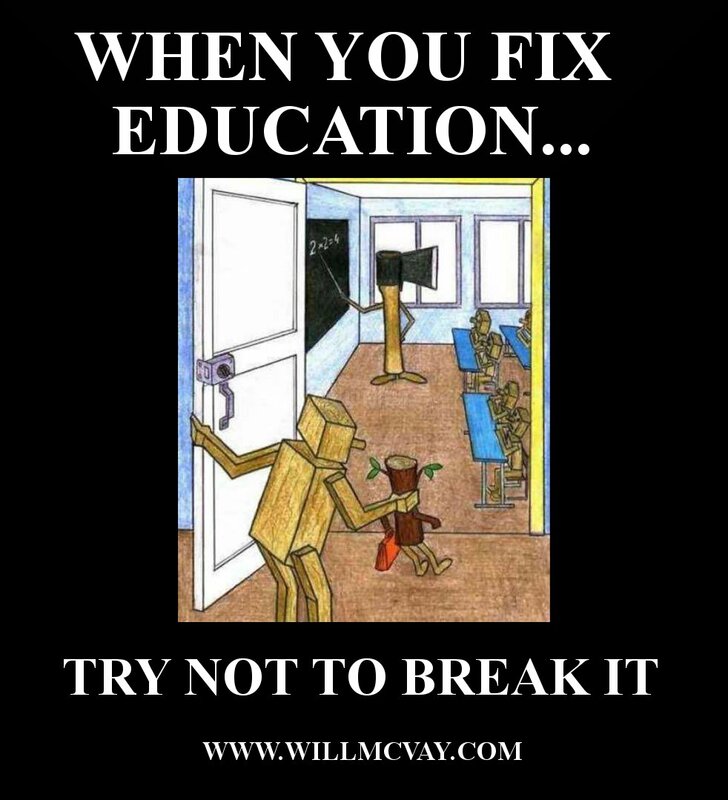 What we cannot have are good teachers constrained by red tape. We cannot have them frustrated by constantly shifting mandates from bureaucratic administrators who haven't seen a classroom in years, if ever. We must find people who can facilitate the educational process and inspire our students, and allow them to do their jobs. Parents know when their student has a good teacher, and parents should be empowered to work with their students and their students' teachers to ensure that we are getting quality for the approximately $18,000 per pupil we spend each year on education in Delaware. Over the next few months, I will post additional articles on education policy in Delaware, but the overarching theme of where we must go from here is that we must work to increase the flexibility of our teachers, not decrease it with mandates from state and federal bureaucrats, racing to the bottom, and leaving ALL of our children behind.